At the J-O-B that I still work at, where I literally punch a clock and sit at a desk where I am not always called to do my heart's work, there is a policy that my password needs to change every three months. Now you know the schtick, it has to have a certain combination of letters, numbers and so on to qualify. I took on creating a password that is a declaration or intention for what I want to create or manifest. This idea came from another brilliant person who used this to heal a relationship with his ex-wife by having a password that said "L1nd@isAmazing" or something of the sort, so that he contemplated what it would be like to have a loving outlook for someone he had been in deep conflict with each time he logged in to his computer. Well, I adopted this practice and this year the passwords have been a series of reminders about getting things done and wrapping up projects that had been hanging around long enough to feel very stale. Not the least of which was completing my Masters' degree. Along with "Year0fCompletion", I had "MAInterdisciplinary!" to cheer me on to get across the finish line. They worked and after I received notification that my major research project had been accepted and the Academic Council had conferred my degree, I changed the log-in to "Everything1sperfect". Typing a declaration that life is perfect over and over turned out to have its own challenges as I was quickly faced with a world where a dear friend's daughter died and my own daughter's marriage went through major upheaval and the UN declared a climate crisis is upon us. Less than ideal circumstances for a perfect life. But, the reminder that life is perfect, no matter what, has been an excellent exercise in trusting the Universe. I was forced to consider what my definition of perfection is and how often I sit in judgement of how this life is not the right one (and of course, how it would be, if only...). As a coach, I often ask my clients to hang in with me in an uncomfortable conversation, one where I am gently provoking thought in areas that are unfamiliar. And, this then applies to me (frustrating when there is no place to hide from your own inner coach!). So, the antidote has been I have been practicing my appreciation and gratitude once again. Next week, as I walk across the much dreamed about stage to receive my degree, I will be present to the power of dreams and holding space for them to come true, even when they seem unattainable. Absolutely miraculous...and perhaps this achievement came from changing my password? Who knows! I remember when this photo was taken in a photo booth in the mall near my childhood home. My mom had never been in one before and the first shot has us both looking stunned at the camera. We caught on and this captures the sheer fun that we had together that day. Shortly after that, my mom was found collapsed beside her bed and we began the three year journey that completed with her death in Victoria four days ago. She died as most of us would wish to go, with her son and daughter at her side, holding her hand, hugging her and sending her out with love. She had been unresponsive for the previous few days and neither my brother nor I had seen her for over a week because of an outbreak of Noro virus in the long term care hospital. I firmly believe that by the time I finally got in to her, she was mostly gone and she never regained consciousness or acknowledged our presence. Still, I got a number of hours of reading Winnie the Pooh stories, singing the songs I remember as her favourites and showering her with loving energy to ease her way in the final days. My singing probably left much to be desired and I got stuck after the first verse of several old songs and had to hum the rest (Daisy, Daisy, give me your answer do, I'm half crazy all for the love of you. It won't be a stylish marriage, I can't afford a carriage, but you'd look sweet upon the seat of a bicycle built for two...la la la). I laughed at my attempts as my mom would have done and I hope she got a giggle from whatever deep place she was dwelling. As it became clear that she wasn't going to bounce back from this downturn and surprise us with a request for a cup of tea as she did last time, the inevitability of her end was apparent. I had stepped out for a bite to eat on the afternoon of her death and my brother had to call to tell me to return quickly. I managed to get there for the last few minutes of her life and had the grace of breathing with her as she drew her last breath. I have never been in the presence of someone dying and it so reminded me of being in the room when my grandsons were born. There is this tremendous exhalation of energy in the very last moment of both birth and death. The world shifts and one soul enters or exits. 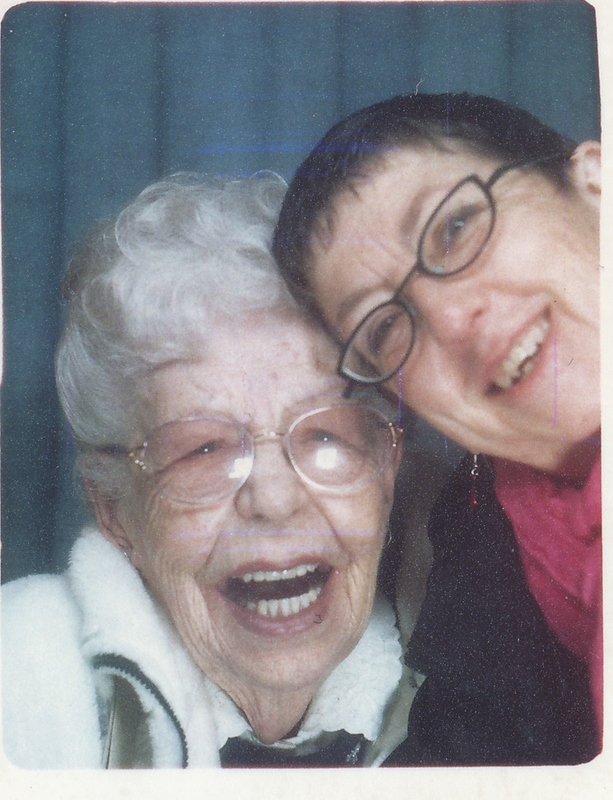 The palpable experience I had of being present to my mom's life ending was a gift. There is no question she was leaving on wings of love. I am peaceful and complete with my mom's passing. There is the business of her death which I am working through as her Executor. There is the difficult relationship that I have with my brother which is stretched to the breaking point in the stress and tension of grief. There is an empty space where my visits with Mom and thoughts about how to take care of her existed. There is a "Mama-less" world to negotiate after three years of being very close and connected with her. We had switched places in the last few years. I became responsible for the decisions and finances of her life. She trusted me to make the choices and although she was frightened sometimes and not certain of what was going on, when she was with me she said she knew it was all okay. I got to take good care of her, be a good daughter and let her know how much I loved her. She was able to tell me how proud she was of me and how much she thought I had done a good job in my life. I am endlessly grateful for the time she had in my city, where I was a five minute drive away and could sit and watch Bonanza reruns with her and brush her hair and be silly with her. I will miss you, Mama. Keep an eye on us, okay? This has been a week of intense emotional roller coasters and I have noticed the parallels of coming in and leaving this earth. I recall being the observer of my daughter's pregnancies and watching and being with her as the contractions came closer and became more intense but birth was not yet happening. It feels as though I have danced a similar waltz with my mama numerous times over this last three years. From arriving in Calgary to the hospital in April 2014, holding her hand as she maneuvered through a landscape of delirium and confusion to this past week, sitting bedside counting breaths as she disappeared deeply beyond contact for long spells. Death, it seems, is as unpredictable as birth and there is great drama and anxiety to both. After all of us showered her with love and said our farewells this past few days, she is brighter this morning and the medical team is trying a Hail Mary pass of antiobiotics and prednisone to see if she will once again step back from the brink. Given my experience with her, it may well work. I am left sitting here at the library contemplating what seem to be horrible thoughts. Why? Why put her through that? As her representative, I can say no but that was not my response this morning. Why not was my answer. You never know, she might live to see another spring and enjoy the birds and the old Westerns on tv for another few months (or years). Sure enough, in the day that passed since beginning this, my mom has rejoined the land of the living and is sitting up talking about getting her hair done on Friday. As I said to the social worker, as I left this afternoon, I feels as though I have run a marathon this week and I am awkwardly explaining to people that my mom has not, in fact, died this week and yes, I will be completing the obligations and assignments that were put on hold as we held a death watch by her bed. The social worker said it is kind of like saying goodbye to someone and then realizing you are both walking the same direction. When is saying farewell and letting go premature? And as I contemplate the places my inquiring mind took me this week, I have this awful sense of guilt for wishing it was over, for encouraging my mom to leave and reminding her that we have this, we will be okay. I wouldn't wish the obvious discomfort and struggle this past week on a family pet, but for some reason, we think we have to keep our loved human beings alive beyond all reason. My brother insisted that he knew it wasn't her time, and perhaps he was right. I feel like a terrible daughter considering that if I had been given the option this week, I would have chosen to assist her in passing over. Because this doesn't have a fairy tale ending. She is not going to suddenly be hale and hearty. It takes 5 litres of oxygen pumped right through a full mask to keep her from turning blue. The wear and tear on her body will eventually overcome her spirit. I have said for the past three years that I would wave a magic wand and have her slip away comfortably watching an episode of Gunsmoke. Isn't that what the physician-assisted death is all about? My mother has never been comfortable with a conversation about the end. Even in her delirium, she is certain that she has done something wrong to be in this state. She has never wanted to face the terms of her death and has avoided any talk of that for as long as I can remember. So even with some legal rights to choose for her, I can't honestly say that I would be following her wishes to apply for the process to end her life by choice. Which of course, has me deliberate over what decisions I need to make and have prepared for my family. Time to get on with putting that down on paper! This remains a mystery to me, this end game. I am, as my son suggested, remaining curious and observing the wonder of it all. Today, I am grateful for a little more time with my mama, laughing and sharing how much we love each other. And that is enough. Last week I renewed my professional membership in the International Coaches Association and ticked the box "10 +" for the number of years that I have been coaching. This year marks the 10th anniversary of my coach training and the discovery of what I wanted to be when I grew up. That year was also my 50th birthday year and a year of unparalleled growth in my career, stepping into vastly more responsibility. I passed the exam for my real estate license and married off a daughter (now, that was FUN!). Perhaps there is something to marking the passing of a decade that speeds up the process and gives a deadline to completing something. Pondering how I want to mark this year has been an interesting process. 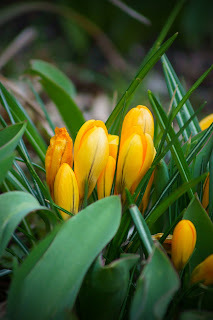 I have bounced between worry that it isn't going to turn out to fulfill my high expectations and consciously letting it flow and unfold as naturally and organically as possible. I have some big projects in the works and as I chip away at each one over the period of a week, I can see some progress and try to be gentle when it feels I am stalled. My intention for this year is to have a blend of completions and beginnings, with just the right balance of play and effort. I have no grand plan other than a promise that I will have one great celebration or experience each month this year. So far, I have been to a live rock show, something I haven't done in years, celebrated with indulgence the abirnerfersary of the first date with my sweetie (42 years ago!) and this month I will see Elton John play live for the first time and take on training in a program of Systems Thinking that fascinates me (that is two for March). The rest of the year stretches out in front of me and I am approaching it with curiosity and a sense of fun to be had. The world looks very different now 10 years later and I am spending some time considering the changes for better or worse. Now, with two marvelous grandsons to play with, living with my sweetheart in the neighbourhood I dreamed of, spending my time directed, for the most part, in what I want to be doing, I don't know that I could have predicted this wealth of happiness that I experience. There were days 10 years ago when I would stand in the shower before heading to the office in Vancouver and wonder how much longer I could keep up the effort and energy it took to work that job with the responsibility and travel. 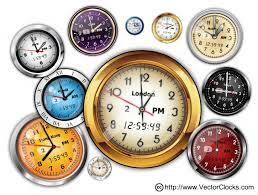 Life feels simpler and easier now even though it remains complicated and complex at different turns. I have conversations with my 70 year old future self and contemplate what life will look like in another decade. This past 10 years were not foreseen by the Carol preparing for work in North Vancouver, so I expect the next will be just as surprising. Time to put some messages in a bottle for that "old gal" considering how to commemorate 2027. What is the note-to-self that you want to forward ahead 10 years? What will you be celebrating? If you had a "do-over" in your life, what would it be? It has been a strange winter in my part of the world. Today, I am gazing on snowflakes gently drifting past my window (which I am encouraging to gain momentum and give me a decent snowfall since I don't have anywhere to go this afternoon). I am not winging south to the sun this year, so I have been more focused on the weather here than usual. I did think this morning how nice it would be to have sufficient disposable income to travel at my leisure and know there was more money in the bank than needed in my lifetime. That led me to consider the concept of "do-over". You know, what Billy Crystal talked about in City Slickers, where you get to start again. I pondered where in my past I would choose a different path if I had the chance to revisit certain pivotal decisions. Like the time when my parents offered me a trip to England if I gave up my boyfriend who they considered a bad influence (I am still married to him, 38 years today, as a matter of fact). Or the travel across Canada proposed by a second cousin so we could finally meet after being penpals for over a decade (decided it was too much money and I have now lost touch with her). And the time when I gave up on a fledgling business, threw in the towel with significant financial consequences (the product we were working on is now sold throughout North America with reasonable success). Crucial choices that had I gone the other way, my life would be very different. Better? Who knows? What became clear was that I wouldn't be here and I don't want to trade this. I have shared before how truly happy I am with my existence, the people in it and the directions I am exploring. Once again I became aware that all of those twists and turns have landed me in this wondrous moment. The multi-verse me may have had the experience of the roads not taken and it would be marvelous to compare notes at some point when I have completed the journey this time round. But for now, the snow has mostly turned to rain that will nourish the crocuses and snowdrops bravely heralding the spring ahead. What about you? 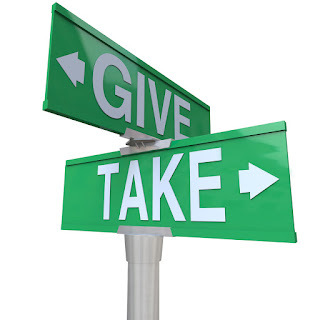 When you reach back to remember those moments when your gut told you the left turn vs the right turn would impact the future, would you choose differently if you could do it over? Where do you think you would be now? One thing is certain, there was never a horse that I should have bet on to win against the odds or one number missing to win the gazillion dollar lottery. And since I really have no regrets about the choices, I can be content with where I am! I hope you are, too. 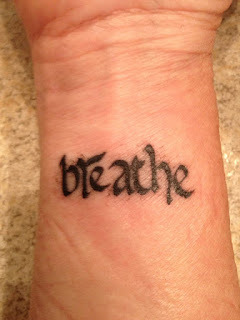 When I first had the word "breathe" tattoo'd on my wrist, I had no idea how often I would glance at it, trace the letters and be grateful for the reminder to consciously do something that is supposedly so without thought or effort. What became clear was the difference made when I did bring focus to my breath to stop and be aware. Lots is written about awareness and mindfulness today and I still experience the outcome in my life as if it is magic. Pausing to breathe in and out instantly pulls my 90 mph mind from the Indianapolis 500 racetrack blurring through the windshield perspective. Miraculously, with nothing more than a breath, stillness, just for a second, overtakes the anxious whirring. A reminder of this minor wonder was worth the curious bee sting sensation that accompanied the inking of my body. I approached the beginning of this year with a troubled feeling that I was already behind. I had the nasty flu that flattened many people over the holidays and looking at the unsent Christmas cards on my desk this morning, I realized that I wasn't getting those two weeks back and it was time to move on to embrace the potential of 2017. I have a marvelous day book for the year titled "Make %*it happen", with the "S-H" artfully blacked out on the cover. It is a "Call-to-action" or CTA as my brilliant marketing colleagues would say. And it is a theme I am very ready to welcome this year. This will be the 60th spin around the sun for this body. It feels momentous and worth celebrating. It will coincide with the completion (if the good lord is willin' and the crik don't rise too much) of my Masters degree and the sesqui-centennial for Canada. There will be all kinds of events and fireworks displays which I will take full advantage of to mark my birthday year. There are also notable opportunities unfolding related to my degree program and advancing my coaching practice and I am really excited about the next twelve months. I feel prepared to be fully at work, exercising my awareness muscles to gain more capacity to be in the moment and yet gazing ahead. Writing, journalling, sharing thoughts and dialogue will enhance my experience and allow me to engage with others to further the happenings. What is your Call to Action? What will make this your best year yet? As I looked at my calendar for this month, I noticed there are a number of pro bono engagements, times that will not be fully compensated, at least in a monetary sense. I am writing a final paper for a course in Leadership and have been asked to describe my leadership philosophy. Well, I thought, mine must be "give it away". Often the flip answers that I say to myself in the Q & A time that goes on in my head are worth pausing to consider. What is it about this desire to bestow something to someone that can have it return such value to us? It is not as though I provide anything less of myself to my non-paying clients. Quite the opposite, I am almost more free to share all of me because there is no assigned value to live up to. I am coaching or advising them purely because I want to see them glow. There is nothing in it for me other than being present to the absolute magic that occurs when another human being gets a measure of themselves and sees their world from a brand new perspective. I have known for a long time that is priceless. And as I puzzle my way through this, I wonder how this balances out in the karmic world? Will it lead to the life I envision simply because I am willing to be generous now? You may have noticed there are more questions than answers here (which probably doesn't bode well for the 1500 word paper due at the end of the week...). There is still the concrete, in the world reality, of paying rent and buying groceries that doesn't get handled just because I have shining eyes from my last fabulous conversation. I can consider a world where remuneration might be that my housing is covered or someone provides me with meals for a week but I don't yet have the structure built to participate in my life that way. I have a sense we are moving towards that but for now my freedom to travel, to eat at wonderful restaurants and indulge my loved ones is based on my bank balance not whether I have sufficiently balanced giving and taking. I am a professional coach, specializing in leadership and business coaching. I am a wife, mother, grandmother and daughter. I love to laugh and am happiest in the kitchen surrounded by family enjoying a glass of wine and shared preparation of food. I am in awe of the power of this medium and honour each and every writer of a blog! My Favourite Blogs - check these out! The (mis) Adventures of Sarah!